The European Commission has launched an unprecedented investigation into controversial changes to the Constitutional Tribunal and media law introduced by the Polish Government since it won an absolute majority in the October 2015 election. Tension between Brussels and Warsaw has been growing since the Polish Government added five 'politically friendly' judges to the country's Constitutional Tribunal, in a move seen by critics as making it easier to push through legislation with less opposition. The European Commission (EC) believes this could break its 'rule of law mechanism' which seeks to rein in EU member governments whose policies and legislation are seen to pose a "systematic threat" to EU values. Although the mechanism was passed last year, it has never been invoked, so this could be the first time it is tested on a member state which is seen to be behaving undemocratically. 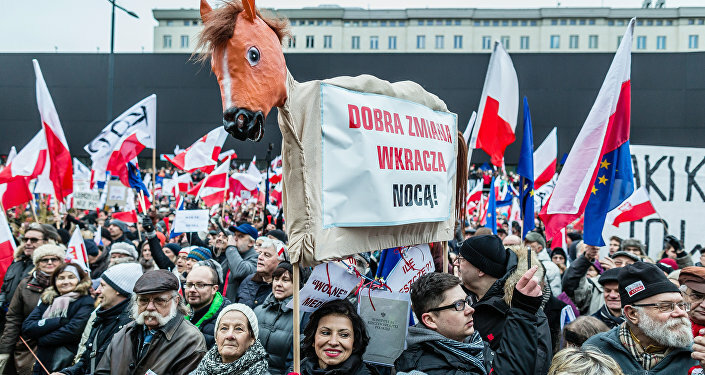 The Law and Justice Party (PiS) led by Prime Minister Beata Szydlo — which was swept to power in the October 2015 general election as the first party to win an absolute majority since 1989 — also introduced a new law which allows the government to appoint the heads of the Polish state media, leading to protests that the move was effectively removing the independence of the broadcasters. The matters were considered Wednesday at a meeting of European Commissioners, after which the Commission's First Vice-President Timmermans said: "Making sure the rule of law is preserved throughout the Union is a key part of the Commission's responsibilities, alongside the other EU institutions. "It appears that the Constitutional Tribunal took decisions which are not currently being complied with by other institutions of the State; and there are measures that have been taken by the newly-elected Polish legislature that affect its functioning." "Today we have decided that the Commission will carry out a preliminary assessment on this matter under the Rule of Law Framework. We are taking this step in light of the information currently available to us, in particular the fact that binding rulings of the Constitutional Tribunal are currently not respected — which I believe is a serious matter in any rule of law-dominated state," Timmermans said. On the question of the new media law and criticism that the government was taking control, Timmermans added: "I am also conscious of the recent reform to the media law, which raises issues relating to freedom and pluralism of the media. "I would like to recall that the rule of law, as defined in the Rule of Law Framework, requires the respect for democracy and for fundamental rights and that there can be no democracy and respect for fundamental rights without respect for the rule of law and vice versa," he said. In an unusual move, Timmermans said he had written to the Polish government asking them to begin a "dialogue on all these questions. Our aim is to solve the issues in a rational way based on our legal obligations."